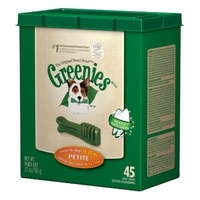 Greenies&reg; Tub Treat Pack 27oz Petite 45 Count | Castleton Pet Supply, Inc. Please note: Not all items in stock. Please contact us for availability or to inquire about ordering. © 2019 Castleton Pet Supply, Inc.. All rights reserved.